Mallory: First To Conquer Everest? Was Mallory First To Conquer Everest? It doesn't matter. They didn't survive so it doesn't count anyway. I think the poll needs more options, e.g. Would like to think they made it but don't believe they did. I don't think we will ever get proof, just more theories. Probably, but the thought that the camera might be found with a retrievable picture is always going to be tantalising until someone actually finds it and proves it either way. 1) The photograph of his wife was left at the summit but is now under layers of ice and snow and will never be found. Caveat: I haven't read the full work. I've just read all of it, as available on that web page. Fascinating stuff, but it doesn't really belong on this thread - it adds almost nothing to our knowledge of climbing Everest, but is mainly about Reincarnation. 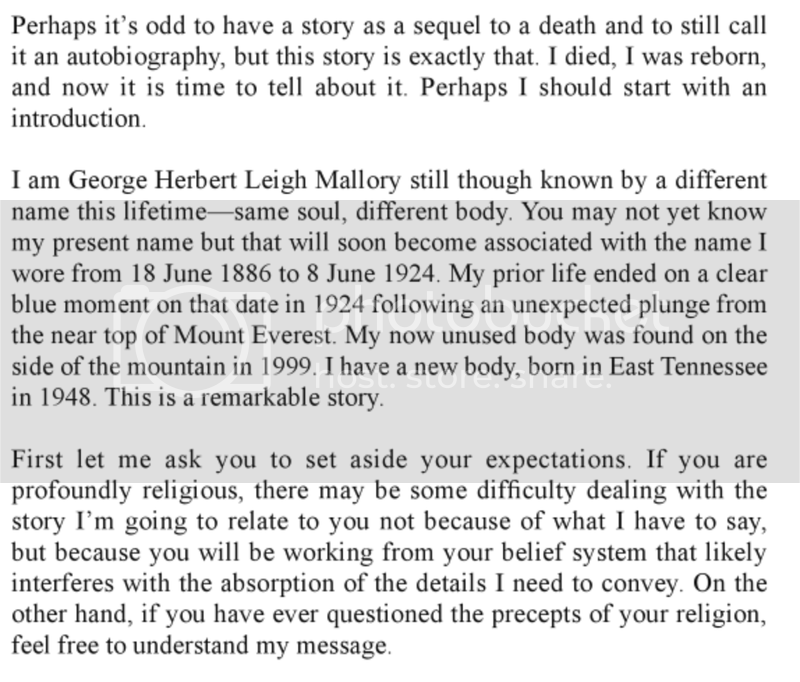 No doubt George Mallory would have been surprised to find that he would be reincarnated as a Gay (or Queer, as he would have probably known it)! Or that one of his many occupations would be as the owner of a biker bar! Nevertheless an interesting read - I found some parallels with my own life (apart from being gay and running a biker bar, that is! ), and with a significant anniversary coming up, "What's life all about?" is a thought constantly in my mind right now. According to this 2013 Guardian article, fellow mountaineer Frank Smythe spotted Mallory's remains in 1936, but kept it a secret. Smythe's son Tony discovered mention of this in reading his father's diaries while writing a book about him and his exploits. The crucial letter was addressed to Edward Norton, leader of the 1924 expedition when Mallory and Irvine disappeared, apparently going for the summit. An ice axe, assumed to belong to Irvine, had been discovered in 1933 by the fourth British expedition to the mountain. It was lying on rock, as though placed there, at 27,760ft, the only trace of either man above their last camp. Smythe ... felt sure it marked the scene of an accident and told Norton why. "I was scanning the face from base camp through a high-powered telescope last year," his letter read, "when I saw something queer in a gully below the scree shelf. Of course it was a long way away and very small, but I've a six/six eyesight and do not believe it was a rock. This object was at precisely the point where Mallory and Irvine would have fallen had they rolled on over the scree slopes." As an aside, I find it curious that Tenzing Norgay is almost never given his full name. He's referred to as Sherpa Tenzing - a bit like calling Edmund Hillary 'Climber Edmund' or 'Client Edmund'. Sherpa is a job description title but is also a Nepalese caste name/surname; ie. one can be a Sherpa but not named Sherpa and vice-versa. Both the job description / title and the formally documented surname usages were projected onto the Sherpa people by outsiders. 'Sherpa' is the name of the ethnic group. This ethnic group was traditionally very tightly integrated. The group consists of 18 family clans, each of which has a clan name. However, the Sherpa people did not use their clan names in personal identification owing to the group being small and closely interlinked enough that everybody knew which clan a particular individual belonged to. In other words, the Sherpa people didn't bother with surnames in the Western sense. If pressed to specify a surname equivalent, Sherpas would conventionally use 'Sherpa' rather than their clan name. In other words, 'Sherpa' was the preferred affiliation reflected in a virtual surname presumed and recorded by others / outsiders rather than Sherpas themselves. Owing to their mountaineering abilities, outsiders (especially Western mountaineers) began using the term 'Sherpa' in the colloquial sense of a mountain guide or porter. Circa 1960 Nepal conducted a census. The census format required specification of given name(s) and surnames. The Sherpa population either demurred from specifying a surname or followed the convention of using 'Sherpa'. Whether by personal attestation or census-takers' frustrated default, 'Sherpa' was documented as the surname for most of the group. As such, 'Tenzing Norgay' is a pair of given names, and no clan / surname is contained therein. As it happens, this wasn't even Tenzing's original birth name. Being called 'Sherpa Tenzing' wasn't a condescending 'Guide Tenzing' nickname akin to (e.g.) 'Mechanic Joe'. It was more like 'Tenzing of the Sherpa People', and accurately reflects the manner in which he would have given a surname equivalent in accordance with prevailing custom. I'm sure I'd seen this story before (about Mallory's body being discovered by Smythe) probably either here, or in FT itself. I think they summited. The often cited reasons - snow goggles in pocket and wife's photo, which he said he'd leave on summit, not found on the body - although other documents were. Although many authorities think they got close but turned back before the final push. This story has fascinated me for years, have to say. It rang a bell with me, too, but I couldn't locate any mention of it here on the forum. How pervasive might thar "unindexed effect" be? Or does it (frustratingly) form a Rumsfeldian unknown unknown? I'm interested in this subject and have never read this account. I suspect you're misremembering and it hasn't been posted here before. No more than 1 - 2% by my estimates (exclusive of retired / damaged threads withheld from public view and inaccessible to search engine bots). In the specific 'Smythe' (vis a vis Mallory / Everest) case, I'm confident nothing was ever posted here in the first place. I used to have a Leyland Sherpa. A Great Mystery. Do we want them solved, or do we want to ponder and theorize forever? Did Mallory summit, Who was Jack the Ripper, what the hell was on the 18 minutes Nixon erased? Do we want them solved? I do. Do we want them solved? I do.